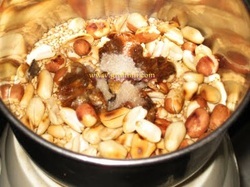 Fry ground nuts and sesame seeds with out oil separately. Remove the skin of the ground nuts. 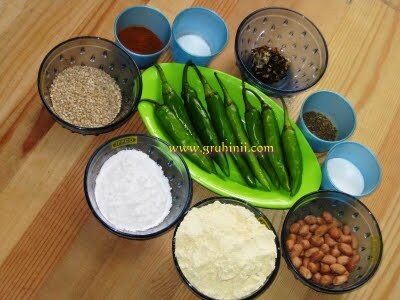 Add salt and tamarind to the fried ground nuts and sesame and grind to fine paste. 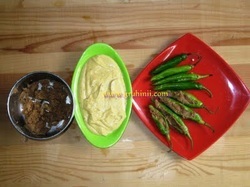 Wash green chillies, drain and make slit length wise. Remove the seeds. Take each chilly and fill and gap with the stuffing and keep aside. 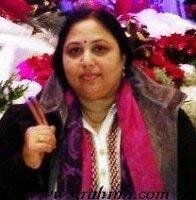 (you can see in the above pic.) 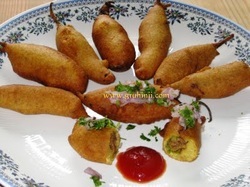 Make a smooth but thick batter of gram flour by adding salt, ajwain, soda bi carb and sufficient water. 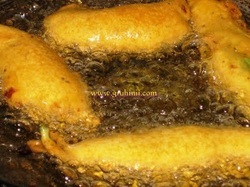 Heat sufficient oil for deep fry in a pan. 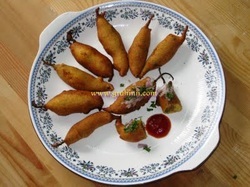 Now dip the stuffed green chillies in the batter and deep fry until golden brown. Remove and drain on a kitchen paper. are ready. Serve hot with tomato sauce. 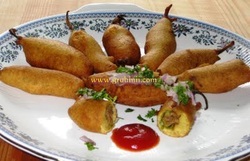 Tip: Garnish with finely chopped onions and coriander for a difference. Enjoy ! !